Chocolate and stout were made for each other, with sweet, malty, slightly bitter flavors. This lovely cake pairs as well with a cup of coffee as a glass of stout. Preheat the oven to 350⁰F. Grease and flour a 9x13-inch baking pan and reserve. In a stand mixer or a large bowl with an electric mixer, cream the butter, then add the brown sugar and beat until fluffy. Scrape the sides of the bowl and beat again to incorporate all the butter thoroughly. Add in the eggs and beat for 1 minute. In a medium bowl, whisk the flour, cocoa, baking soda and salt. Measure the yogurt and stout and reserve. Beat the flour mixture into the butter mixture, then scrape down, beat briefly, then add the yogurt and beat to mix. Add the stout last, beating to incorporate, scraping down and mixing one last time for a smooth batter. Scrape the batter into the prepared pan and smooth the top. Bake for 35-40 minutes, until a toothpick inserted in the center of the cake comes out with only moist crumbs attached. Let the cake cool completely on a rack. Serve squares of cake with lightly sweetened whipped cream. 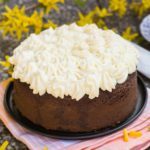 Try this delicious cake with your own homemade whipped cream!